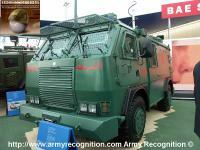 Tata Motors presents the Tata Mobile Bunker, a new concept of armoured personnel carrier based on the Tata LPA 713, 4-wheel drive platform. The vehicle is protected against gunfire, corresponding to ballistic protection of NIJ Level III. The Tata Mobile Bunker is a highly mobile platform and can be used as a base for various protected applications like troop carriers, ambulances and buses. The Tata Mobile Bunker vehicle can be used to carry military personnel through naxal infested parts of the country safely. The Tata Mobile Bunker is powered by a 155 bhp , 550 Nm engine. It features firing ports and roof hatch for retaliatory action , excellent gradeability and high ground clearance for all terrain usage , AC unit provided for better ventilation inside the vehicle and is CMVR certified. It is capable of a top speed of 80 kmph and has a payload capacity of 1 tonne.